“Ad Location” is a static location which you can display your advertisements in it as banner or campaign. Also it’s possible to override their content in every single page you want. 25 different Ad Locations in Header, Post content, Skyscraper and Footer for two different views, Normal & AMP, are available for showing your advertisements. AMP & Normal views need different Banners and also have different Ad locations. We introduce their Ad Locations as follow. Now we describe how to find each of these locations in plugin option panel. 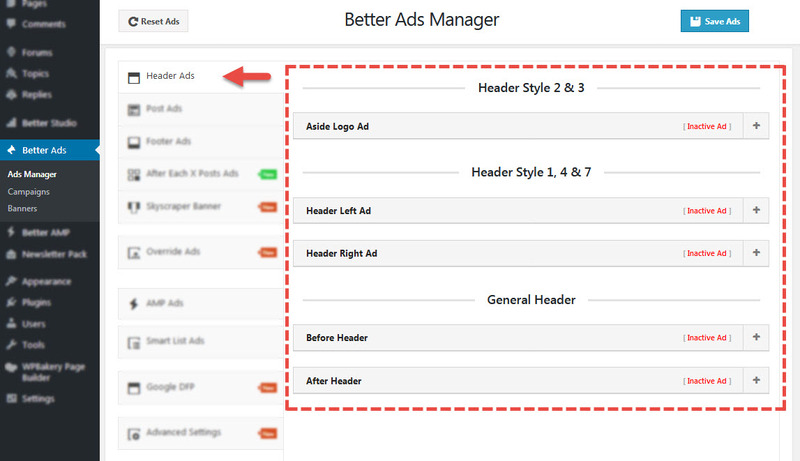 1- Header: Go to Better Ads → Ads Manager → Header Ads, here you see a list of all Header Ad locations. Different header styles have 0, 1 or 2 Aside Logo Ad locations; For more information read Header Options. 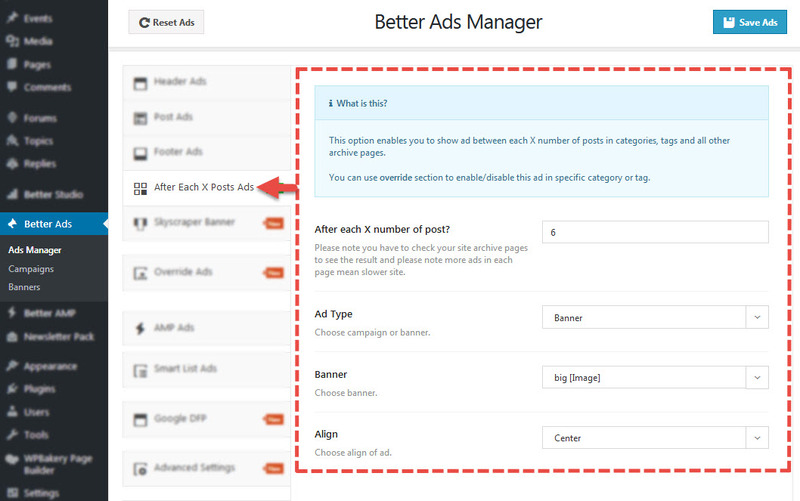 2- Post: Go to Better Ads → Ads Manager → Posts Ads, here you see a list of all Post’s Ad locations. 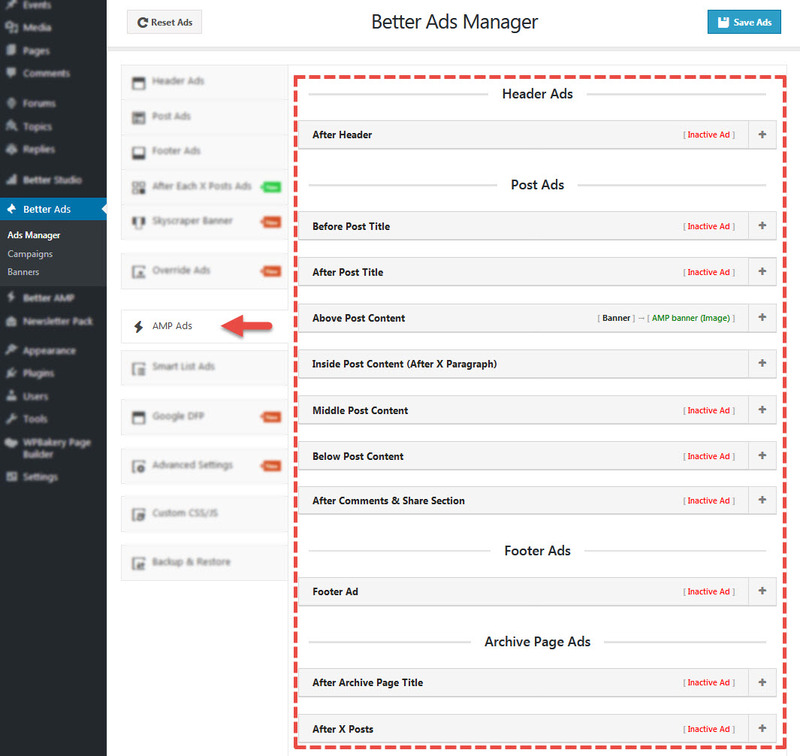 3- Footer Ads: Go to Better Ads → Ads Manager → Footer Ads, here you see a list of Footer Ad locations. 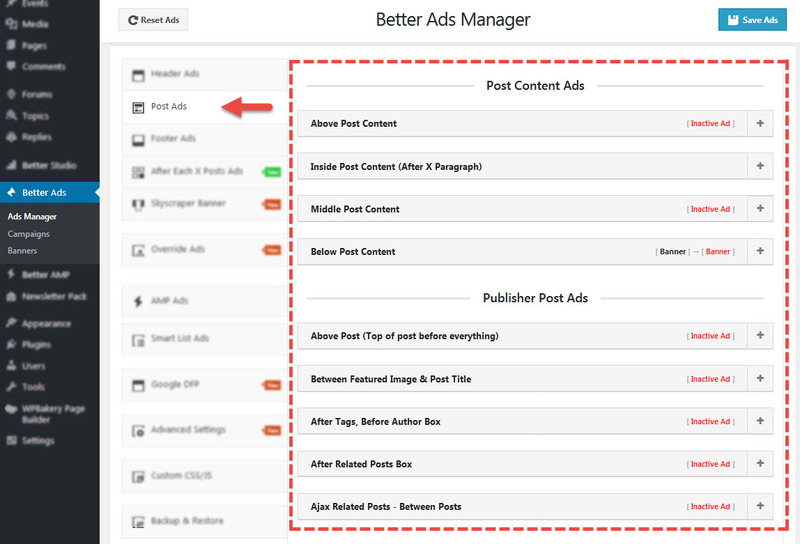 4- After Each X Posts Ads: Show ads after each X number of posts in categories, tags and all other archive pages. Read more about after X posts ads. 5- Skyscraper Banner: A skyscraper Ad is a tall and narrow banner advertisement placed to the right or left of content on a Web page. Standard dimensions for a skyscraper Ad is 160 X 600 pixels. The skyscraper offers an advertiser a large space for a message. Skyscraper ads are outside of main column of website’s content. In small screens, they are not visible. 6- Smart List Ad Location: Smart List has its own ad locations. 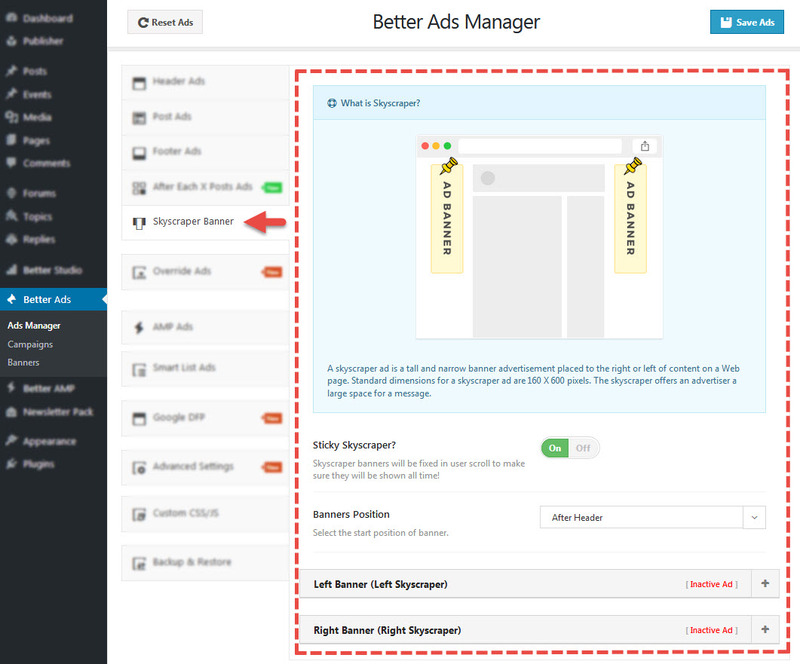 Go to Better Ads → Ads Manager → Smart List Ads. Remember these locations belong to Publisher AMP theme and also for AMP mode (read more about AMP). 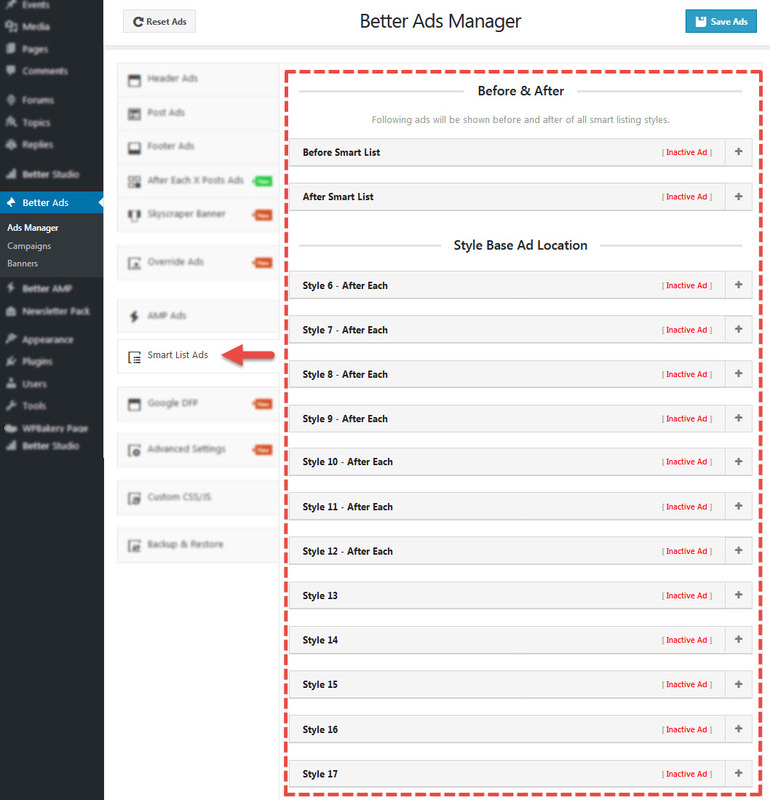 All of these locations are gathered in one place, go to Better Ads → Ads Manger → AMP Ads.